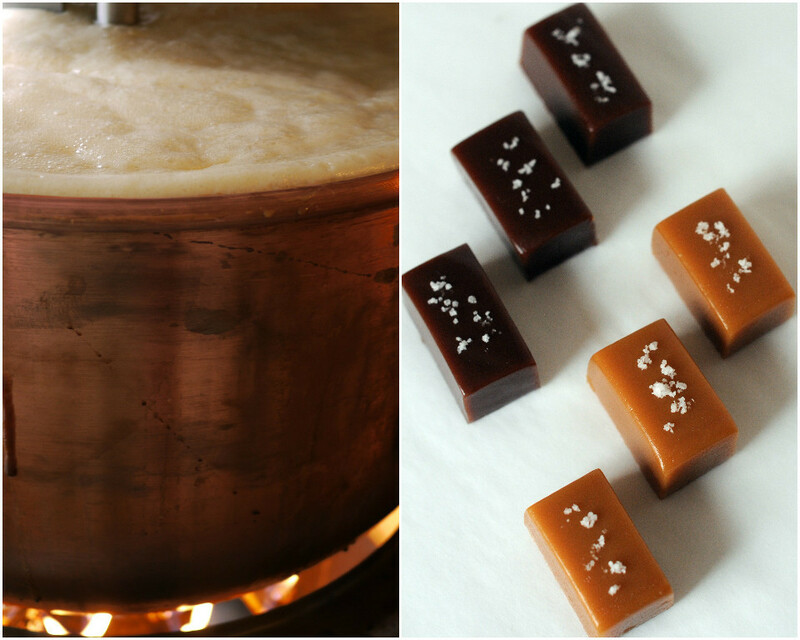 Homemade candy is something to be truly treasured – caramel in particular. Our mouths water at the thought of the ooey gooey goodness that results from the tedious task of heating, stirring, and cooling this temperamental confection. Stepping into Red Kite Candy is like walking into Willy Wonka’s Chocolate Factory. Shiny copper pots and bright red wrappings add to delightfully sweet aromatics. If Wonka was the chocolate madman, Elaine McCabe is the caramel maven. Elaine greets us with a warm smile and a hug as we enter her candy factory in Bradford VT, the result of a fairly recent move from her original homestead candy operations. Conversation with her feels easy and comfortable, as if we’ve known each other all our lives. Her warm spirit is evident right from the get-go. Her husband, Mike, does nothing but enhance the welcoming atmosphere surrounding us in this caramel heaven. The beginnings of Red Kite came about quite naturally, with a bit of a push to throw caution to the wind. Elaine had always gifted her homemade caramels to family and friends. Her loved ones repeatedly encouraged her to start her own business. The sweets were so delicious, they would undoubtedly do well outside Elaine’s social circle as well. Many years went on like this, until Elaine was diagnosed with breast cancer in 2007. 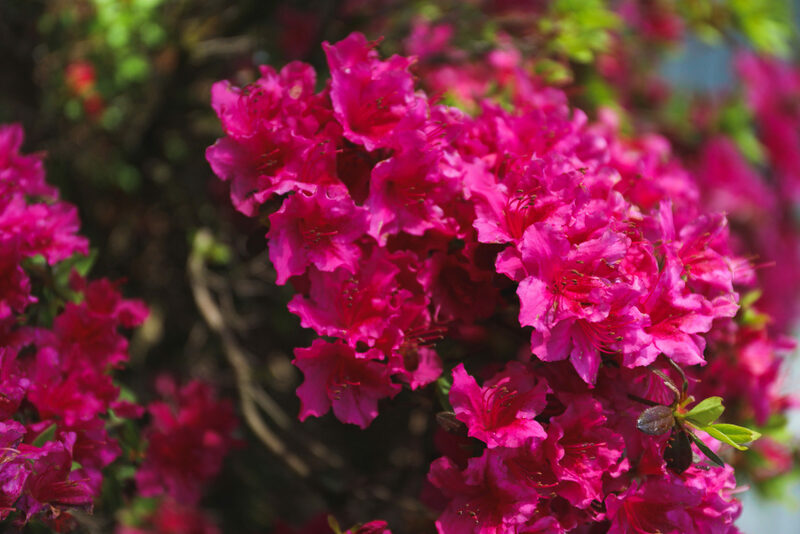 After undergoing a lumpectomy, it became clear to her that it was time to do something she truly enjoyed with “absolutely NO FEAR whatsoever.” She says, “I had never experienced an epiphany before … clarity and calmness came over me. I knew with conviction what I was going to do. It truly didn’t matter to me if anyone else said no … plow ahead.” Fearlessness takes on new meaning when you put life into perspective. Elaine dove into a business based on pure desire, and this is what we love so much about her and the resulting Red Kite Candy. Without a doubt, Elaine and Mike have gone to great lengths to assure Red Kite met their high standards from the start. The name and symbol of the business, for instance, involved much thought and significance. As Mike began a running list of names he thought may be fitting for the company, Elaine sought something beyond her own namesake. “McCabe Candy” fell short of Elaine’s desired names. However, “Red Kite Candy” struck something in her instantly. This feeling stemmed from the connection with her brother, who has since passed. Childhood memories came flooding back when she heard it. Elaine’s brother, Stan, had always been there for her. She remembers Stan going with her to hang the bike she forgot to put away late at night. Her fear of the dark was alleviated by the protection of her big brother. Moreover, Stan never ceased to make time for his little sister. “If I had an art project to do for school, he was there to guide me and help me … we climbed trees together, played in the creek, had snowball fights and he loved to build me ‘tents’ in the summer.” This idyllic sibling bond culminates in one memory in particular. 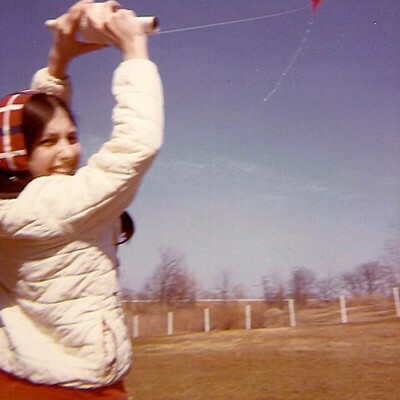 “Stan and I always looked forward to that first day after winter (usually March in Ohio where we lived) where we could go out and fly kites. My mom would give him an old sheet and he would cut it up and make long kite tails from it. He always got my diamond kite up in the sky first before he would fly his. Sweet and caring … in his nature.” We see this kindness translated in Elaine’s business as well. Just as Stan shared his big brother talents of flying kites and making tents, Elaine has created a business to share her caramels with friends, family, and customers. The company’s diamond kite logo went on to spur the company’s signature color, Red Rider red (not fire engine red, as Elaine points out). 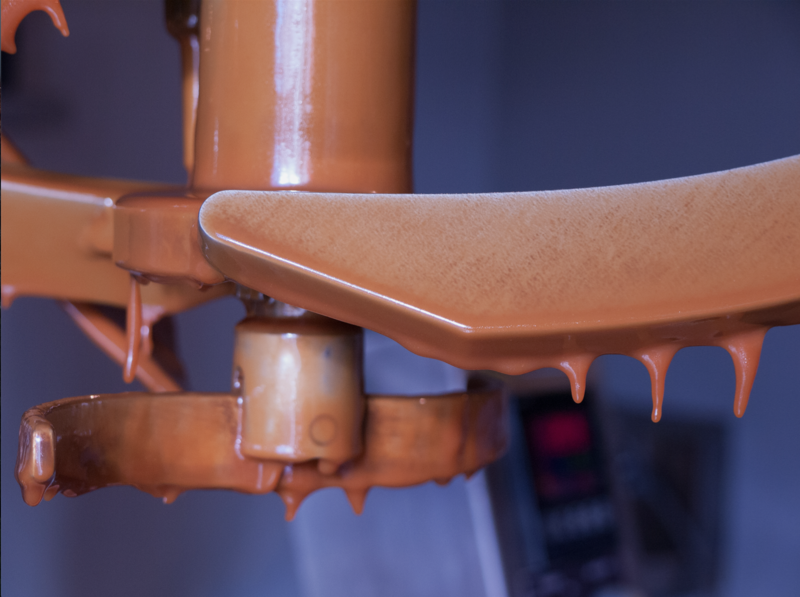 The color carries throughout the business, from the store walls, to its pendant lights, to the wax paper swaddling each delicious piece of caramel. Beyond branding, Elaine has refined the art of spoiling your taste buds. Her candies, from caramel to toffee, are irrefutably scrumptious and continue to evolve in variety and flavor. Original and sea salt remain the most popular of the caramels. 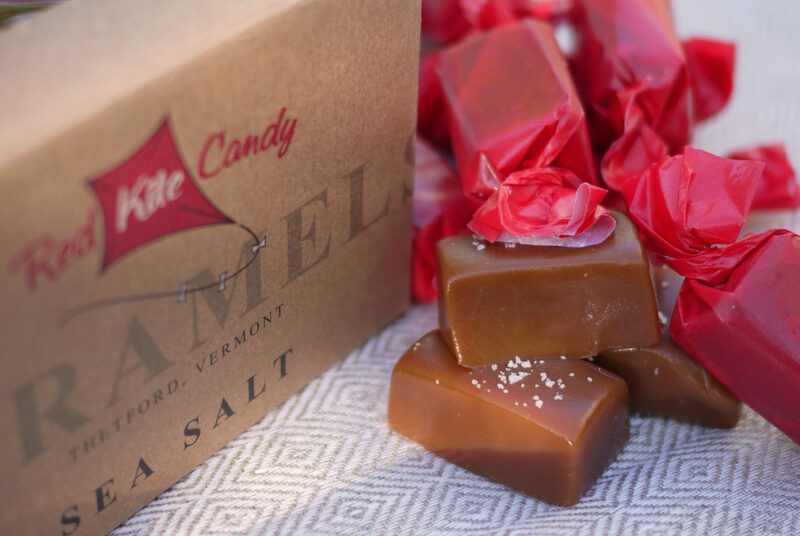 However, we also love Red Kite’s Chai Caramels with Chaiwala chai and their Vermont Maple Caramels. 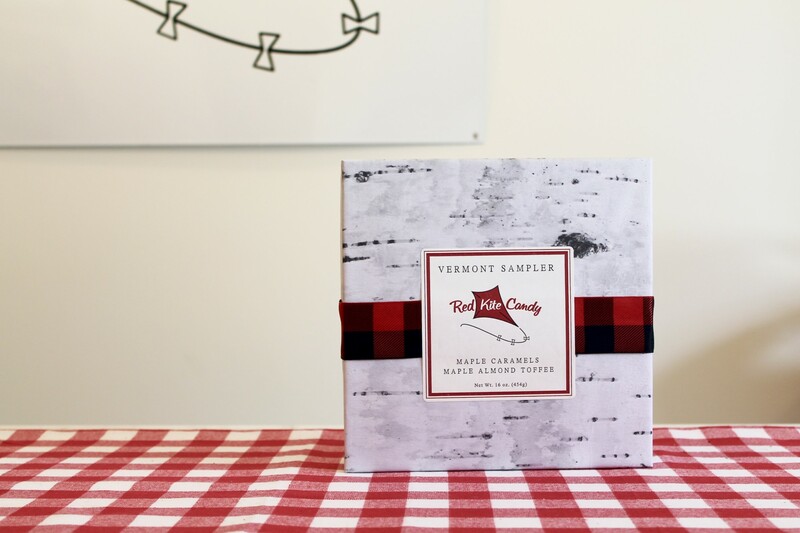 To truly capture all the local favorites, Red Kite Candy is about to introduce their newly designed Vermont sampler, appropriately wrapped in a red and black plaid ribbon. 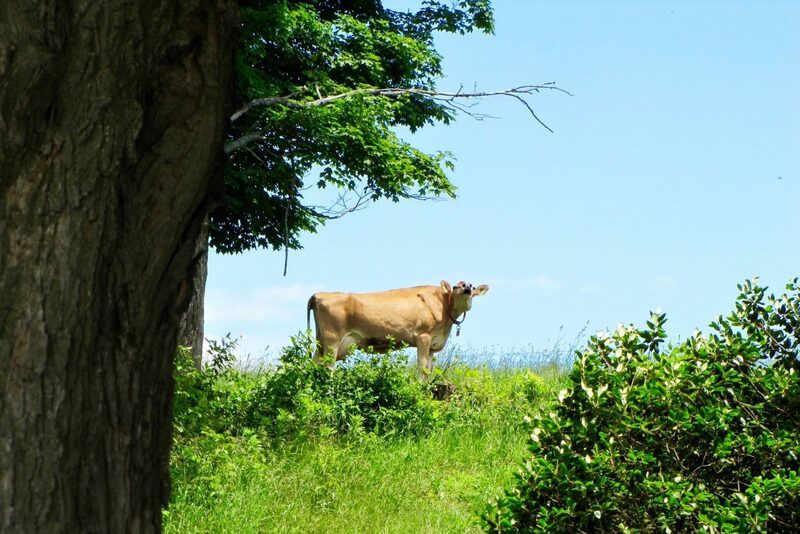 Elaine takes much inspiration from her drives to Bradford from her home in Thetford VT. Just like many of the rural roads throughout the state, her trek comprises of rolling green hills and pastoral landscape. 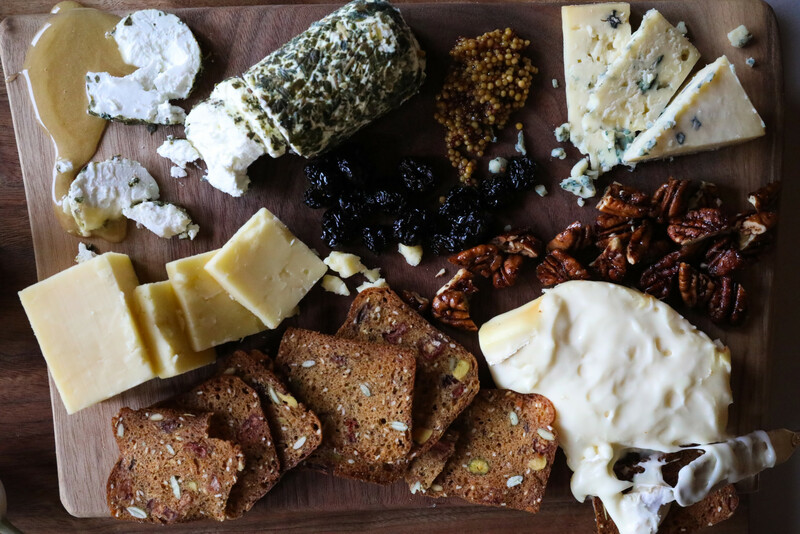 The beauty of Vermont and its organic producers motivate Elaine in creating goods that not only satisfy her customers, but also live up to the state’s rich agricultural heritage. The ingredients she puts into her candies are quality, evidenced by her caramel’s luxuriously creamy taste and texture. Elaine notes how fortunate she is to source all of their milk, cream, butter, eggs, maple syrup, and honey locally, attributing to Red Kite’s mainstay deliciousness. Each caramel provides a few bites of pure milky, sugary bliss – a taste that fittingly reflects her fresh ingredients. 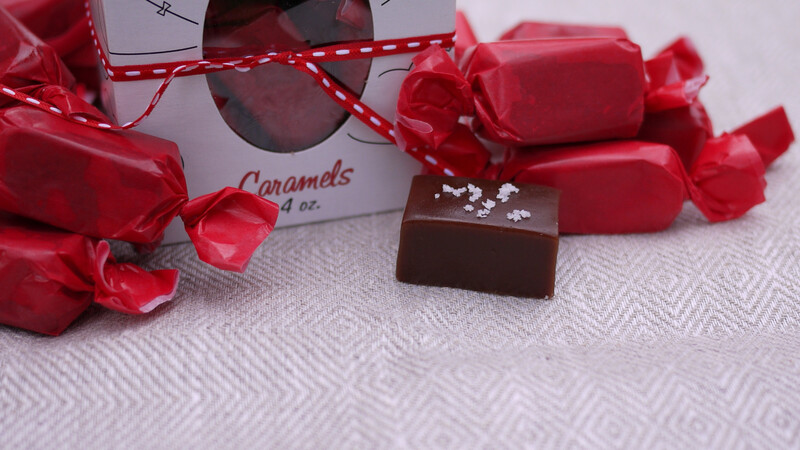 We’ve been carrying Red Kite Candy’s Sea Salt Caramels since our early years as innkeepers. Local, individually-wrapped, and a pleasant alternative to chocolate, we do our best to keep from eating these sweets ourselves and save them for our guests. You can grab your share of Red Kite Candy at Elaine’s storefront in Bradford or at various retailers she lists here. Indulge your sweet tooth and get your sugar fix with one of Elaine’s many sweet confections!